Liz Bonnin joins a scientific team aboard the research vessel the Alucia on an expedition across the Galapagos Islands. Liz Bonnin joins a scientific team aboard the research vessel the Alucia on an expedition across the Galapagos Island. The journey begins on the Galapagos' west side at the youngest and most volcanically active islands in the archipelago, Isabela and Fernandina, which are home to a richly diverse wildlife scene. Here, Liz and the team journey into the clouds above Wolf, the tallest volcano in the Galapagos, where they join a group of biologists hunting for the elusive pink iguana, which teeters on the edge of extinction. But how and why did it come to live on the top of a volcano? Back on the research vessel, Liz boards Alucia's Triton submersible to descend a kilometre into the ocean abyss in search of a new species hiding in the darkness. Liz also travels to one of the most remote locations in the Galapagos, Alcedo Volcano, in search of the largest population of giant tortoises. Plagued by drought in recent months, scientists are keen to find out how this prehistoric species has fared. 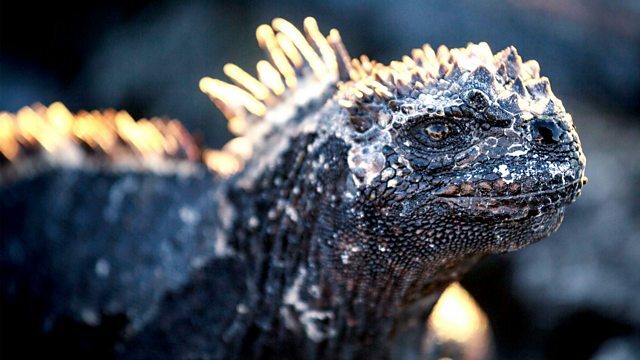 Finally, Liz helps out with a groundbreaking science experiment to x-ray marine iguanas that have so far stunned the scientific community with a new mutation. As with all life on these remote islands, the key to survival is adaptation.